In a large skillet, melt butter over medium-high heat. Add garlic, cooking for 30-60 seconds until aromatic. 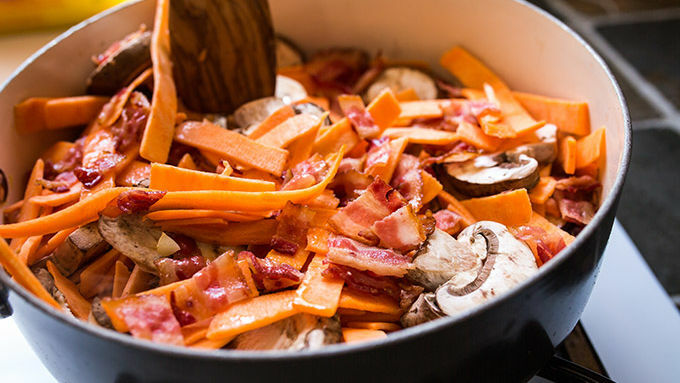 Toss sweet potato ribbons and mushrooms into the pan. Sauté until shiny and crisp-tender, about 3 minutes. Whisk together half-and-half and cornstarch. Drizzle atop the veggies in the pan, stirring gently just until the sauce begins to thicken. Lower heat to medium, toss in spinach and bacon, and allow to cook just until the spinach begins to wilt. Transfer to a serving bowl and season with salt and pepper to taste. Top with Parmesan. This recipe also tastes great tossed or topped with grilled chicken. Seems the spiralizer movement is here to stay. 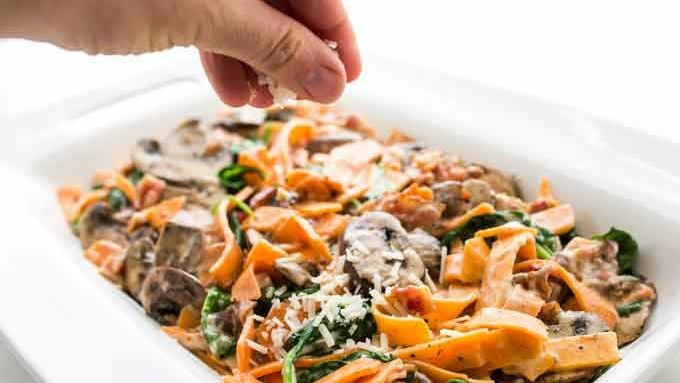 Veggie noodles of all kinds are the perfect pasta stand in for everyone from gluten-free goddesses to paleo cavekids. For those of us too lazy to make their own veg noodles, ready-made “voodles” have been showing up in all sort of forms. The fresh fruit and deli section of three of my local grocers now sell zucchini, sweet potato and butternut squash noodles. All cut and ready to cook. Be still my heart. 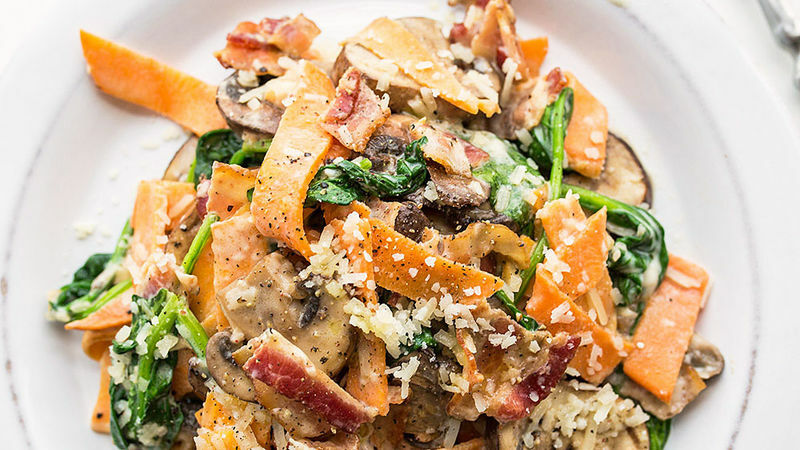 Whether you’ve got your own grocery with ready-to-go options, are a rock star with the spiralizer, or have an easy-peasy handheld julienne cutter (perfect for “peeling” your own spaghetti-esque noodles), you gotta grab a sweet potato and toss it in garlicky carbonara with mushrooms and bacon and spinach and love. Need I say more? Grab a fork, baby. Dinner (and bacon, and Sweet Potato Carbonara) is served.